U of T Chemistry Student Union | Here for all your chemistry needs! Here for all your chemistry needs! Thank you all for coming out to our elections today! Thank you to all who ran! You were all wonderful and it was a very tight race! Do stay involved and keep a lookout for our Fall elections in September! Thanks for partnering with us throughout! It has been a fantastic year. We have one last event in April! So stay tuned! Posted on March 21, 2019 | Comments Off on CSU Elections! And come give your position speech on Fri, Mar 29 at 3pm in LM204. Feel free to email us if you can’t make it! There will be pizza and pop! See ya there! Comments Off on CSU Elections! 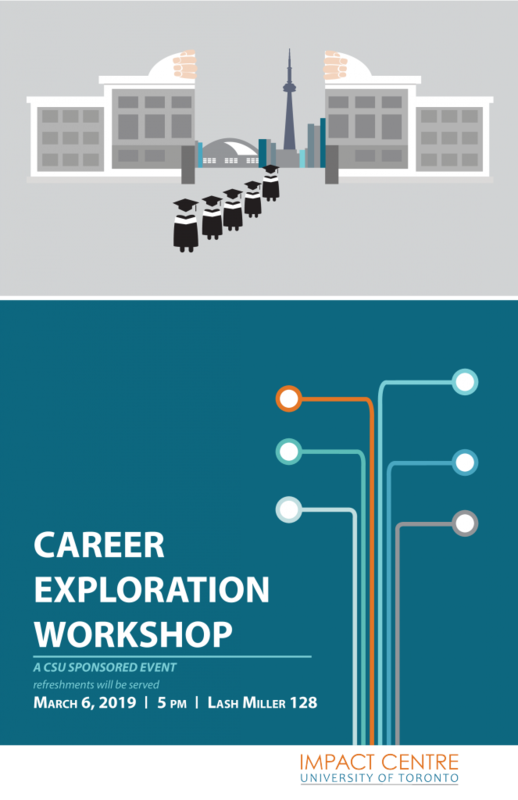 The Impact Centre will be giving a talk on careers after undergraduate studies in Chemistry. This will be a really good opportunity to find out more about the various options available apart from graduate school! Coffee and timbits will be served. See you there! We are really excited to host Professor Alán Aspuru-Guzik for our winter academic seminar. Professor Aspuru-Guzik is the Canada 150 Research Chair and newest faculty member of our department. 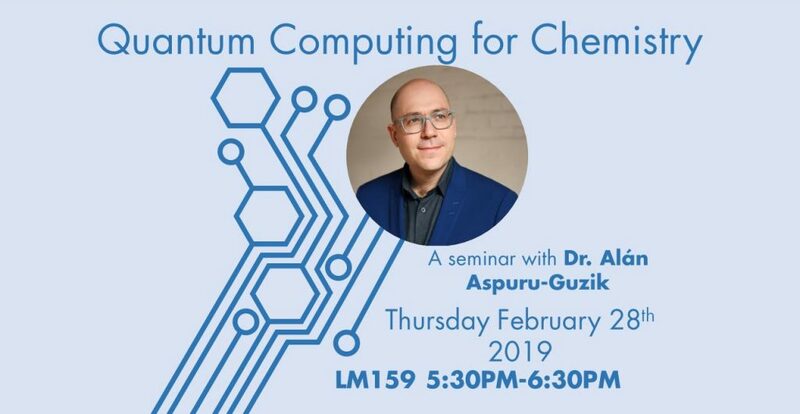 He will be sharing about his unique research at the intersection of Chemistry and Computer Science. Refreshments will be served at 5:15pm and the talk will commence at 5:30pm, after which there will be a brief session of Q&A. CSU x ChemClub Pub Night! Posted on January 25, 2019 | Comments Off on CSU x ChemClub Pub Night! Wow and just like that January is over! 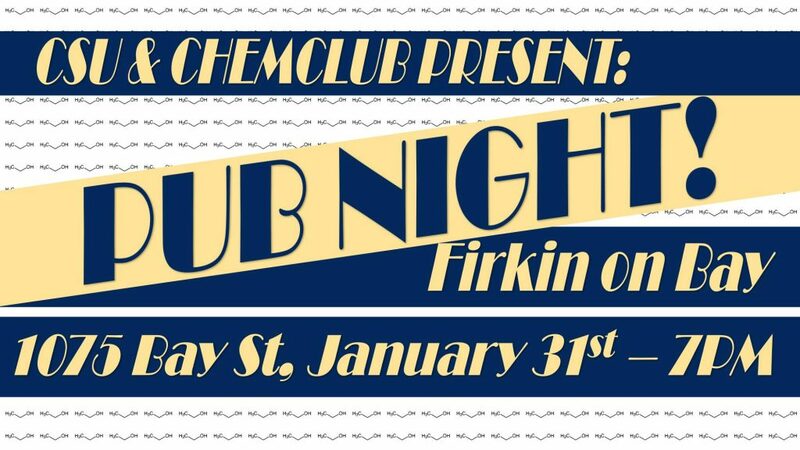 Come celebrate the last day of Jan / beginning of midterm season with us at Firkin On Bay! We will be giving out 2 FREE drink tickets per person and there will be a ton of FREE food! Comments Off on CSU x ChemClub Pub Night! Happy New Year! We’re excited to announce that we’ll be starting a new undergraduate mentorship program! This is an great opportunity for upper year students to share the wealth of experience that they have, and for lower year students who are searching for advice regarding CHM courses, resources and future direction with the program! Come find out more about grad programs! 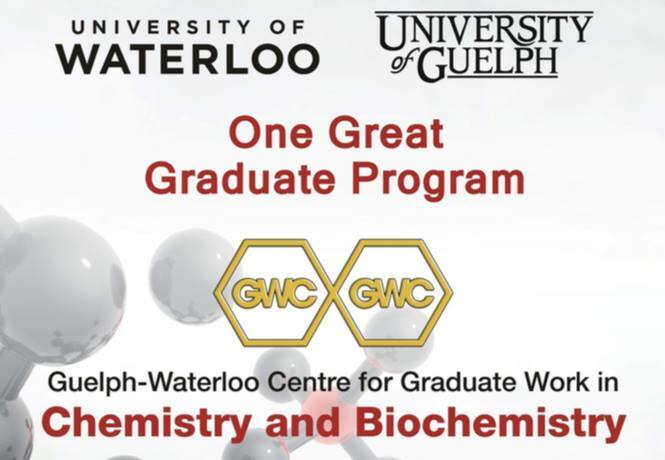 The Guelph-Waterloo Centre for graduate work in Chemistry and Biochemistry will be visiting on Thursday, January 17 at 12pm in LM128. There will be FREE pizza and drinks! See you there! Posted on November 30, 2018 | Comments Off on Exam Destresser! 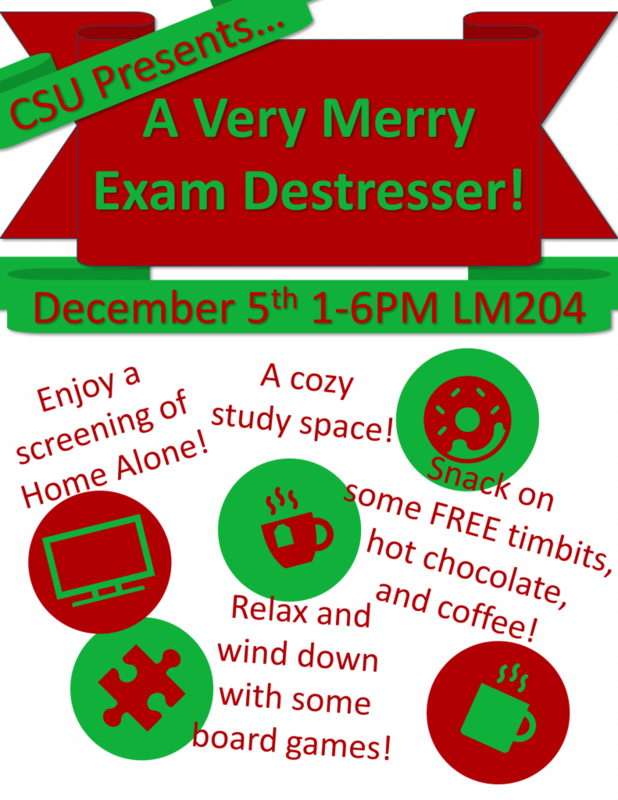 Come celebrate the last day of term and get christmasy with the CSU! There will be FREE hot chocolate, coffee and timbits along with lots of board games, a screening of home alone, Charlie brown’s christmas playing on repeat, and a space set aside for quiet studying of course! Comments Off on Exam Destresser! Can you believe its November already? 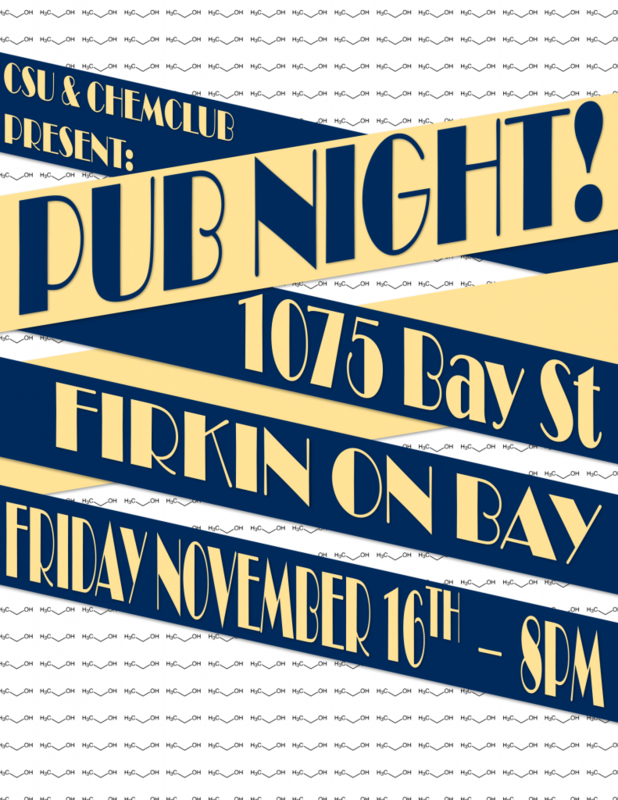 Come forget about midterms / research with us this Friday at Firkin On Bay! 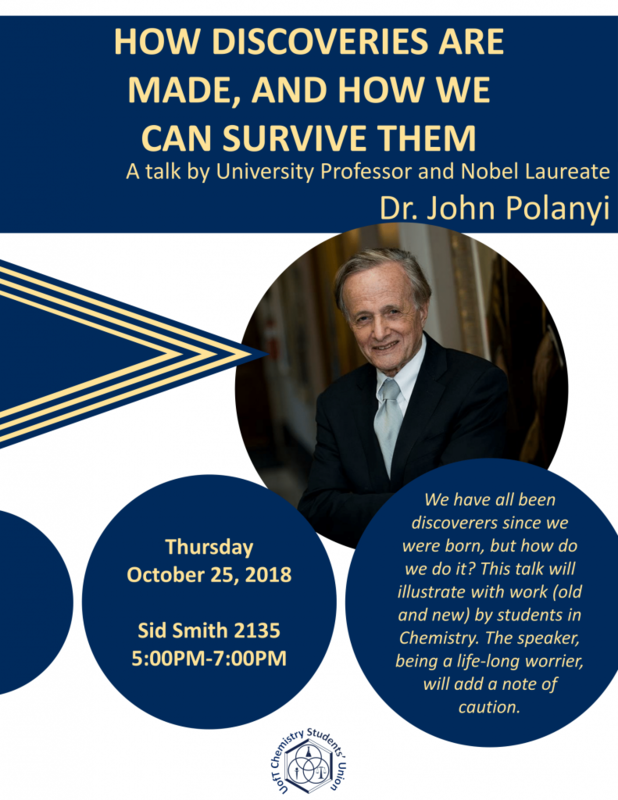 On Thursday, October 25, 2018, from 5-7pm in SS2135, we will be hosting a talk by Professor and Nobel Laureate John Polanyi! He will be speaking about “How discoveries are made and how we can survive them” as well as his recent groundbreaking discovery featured in Science Advances on how to control chemical reactions. To read more about Professor Polanyi and his research, CLICK HERE. Coffee and donuts will be served! We hope to see you there! To return to the home page at any time, click on the CSU logo at the top left corner of the page!